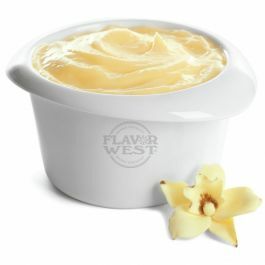 Smooth, sweet and creamy standalone vanilla custard flavor. This flavor delivers one of the best vanilla taste buds experiences. Type: Vanilla Custard Water soluble flavoring. Ingredients: Natural and Artificial Flavoring, Ethanol and Propylene Glycol. USP Kosher Grade Flavoring. Usage Rate: 15-20% for E-use. Flavor suitability: Desserts, cakes, pastries, smoothies, ice cream, drinks, baked treats and more. Specific Gravity: 1.03 No Refunds on Flavoring. This is one of FW's flavors I love and have to keep on hand. This is my ADV (not the only flavor I use though) and love the flavor if you have tried or would like a great custard flavor,this is it. Shipping was quick as always three days and this time I doubled up and ordered a 32oz. bottle. If you DIY this is a must have in your vape arsenal . Thank you FW for the great assortment of flavors you offer. Simply I have been putting this in almost 90% of my mixes now. As a standalone it is delicious, as well as complimenting so many other flavors. I will be ordering again and again. This is an excellent custard flavor not really sweet or should I say,it is not a real sweet flavor.This is by far the one flavor I pick up from FW with each order,i picked up a 16oz. bottle with last purchase just to make sure I always had it on hand.The custard is very creamy and not real heavy on the vanilla taste.You get the creamy egg custard on the exhale and the spiced vanilla on inhale.At 20% mixed 50/50 it is excellent.